The TDA7514 is a device for car-radio applications that combines full RF front-end functions with advanced audio-processing capabilities. As far as FM and AM functions are concerned, the TDA7514 features front-end processing, including the digital tuning PLL. IF processing with demodulation and variable-bandwidth IF filtering (ISS), stop station and quality detection functions, FM stereo decoding by means of a fully integrated adjustment-free dedicated PLL and, finally, AM and FM noise blanking (AM noise blanking comprises one IF NB as well as an audio NB). The FM stereo decoder and the noise blanking functions are realised entirely without external components. The FM front-end circuit features an image-rejection mixer that allows the simplification of the external preselection filter, and a very low noise level that allows getting rid of the external preamplifier with no loss in sensitivity. 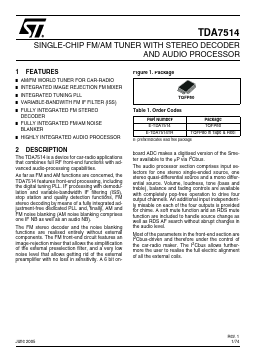 A 6 bit on board ADC makes a digitised version of the Sme ter available to the µP via I2Cbus. The audio processor section comprises input selectors for one stereo single-ended source, one stereo quasi-differential source and a mono differential source. Volume, loudness, tone (bass and treble), balance and fading controls are available with completely pop-free operation to drive four output channels. An additional input independently mixable on each of the four outputs is provided for chime. A soft mute function and an RDS mute function are included to handle source change as well as RDS AF search without abrupt changes in the audio level. Most of the parameters in the front-end section are I2Cbus-driven and therefore under the control of the car-radio maker. The I2Cbus allows further more the user to realise the full electric alignment of all the external coils.